Will be on my secret mission. Snakes up, the restless sword encased, clanks to blame. To knife sharp and overpower. The sky in disastrous smoke blind. The foaming human streams in uproar. For happiness, fortune or fondness fine. Their wild frenzy to bustle up. To the Jats and others. Rise of the crimson sun to witness. For competence in my mission. At my call let the country awake. No more suspense or fear. As our noblest mission will commence. Millions rush to you for surrender. Their grief never to heal. To spell the deadly bane. To torch mankind its flame eternal. Original in Bengali Guru Gobind by Rabindranath Tagore of the book Katha (Legends) written in 1888. 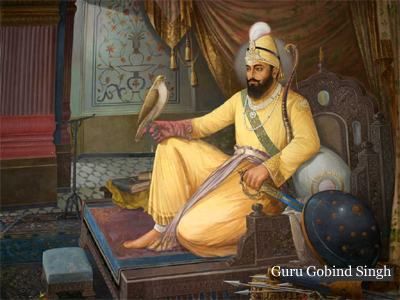 Guru Gobind Singh was the last and 10th Guru of the Sikhs. The first one Guru Nanak was born in 1469. He preached the doctrines of equality of all human beings. However, culmination of the religious and social liberalism initiated by Nanak took place only under Guru Gobind Singh in the 17th Century. In parallel, the Sikhs have a glorious history of struggle against the Mughal’s inhuman torture over centuries which gained momentum mainly from Guru Gobind’s inspiration. When he was only 14 years of age, his father Teg Bahadur, the 9th Guru, had his martyrdom during the reign of Aurangzeb, for revenge of which Gobind took oath. The poem is on this stage of Guru Gobind’s life. History records that it was Guru Gobind’s father Teg Bahadur who was on exile for 20 years. Guru Gobind’s exile was for a much shorter period as I gather from some authorities on Sikh history. However, this factual error should not stand on the way of the inspiration the Poet wants to evoke based on Gobind’s life.